Forum » SpaceEngine » Off-topic Discussions » What would you do if you ruled the world? lets just stick to our great leader apenpaap ideas! Good to see that (La)TeX still is in use. And it should be like that by law, so that must be added to the list. Perhaps also a Donald Knuth day to honour that and many other things. He's multi-talented. apenpaap, you have my vote too, obviously. Great ideas here apenpaap, voting for you for sure. And unfortunately I can not vote for apenpaap, because of the smiley on the German flag. Had he said, all the flags are banned, along with all national states, okay. If you mean 99942 Apophis, latest observations have basically ruled out any chance of an impact with Earth. Therefore we should colonize it. Therefore we should colonize it. Yes, but imagine that we colonize Apophis, and somebody is organizing an open-air rock concert, and all the people come together at one point! That would shift the center of gravity of Apophis and change the orbit! This brings the asteroid then perhaps on a collision course with Earth! yeah in my physics class some classmates scared everyone with the asteroid that has a chace of 1/30 to hit us. I would slam it into the moon for scientific reasons. Yes, but imagine that we colonize Apophis, and somebody is organizing an open-air rock concert, and all the people come together at one point!That would shift the center of gravity of Apophis and change the orbit!This brings the asteroid then perhaps on a collision course with Earth! Yes. Like how if we landed on 2016 H 03 it could set it on a collision course. It wouldn't to much damage if H 03 hit, but Apophis, I used Universe Sandbox 2 to see what kind of damage it could do. View from Apophis as it comes towards earth, That would be a scary sight! You can't see the main crater, but I'd imagine at least 100 people died. That could be a dangerous thing. If we colonized the moon, doing that would destroy a average crater-colony. Well it wouldn't hit the colonized part, in my view the north and south poles of the moon would be mined of helium 3 and most of the moon would be as it is today, some craters would be terraformed but not much in favor of larger targets like mars. In my world hundreds of craters would be terraformed perhaps thousands but never the entire moon, there would be a drill on the moon and I would see if a drillbit would reach the core somehow if possible. Wish you were here? 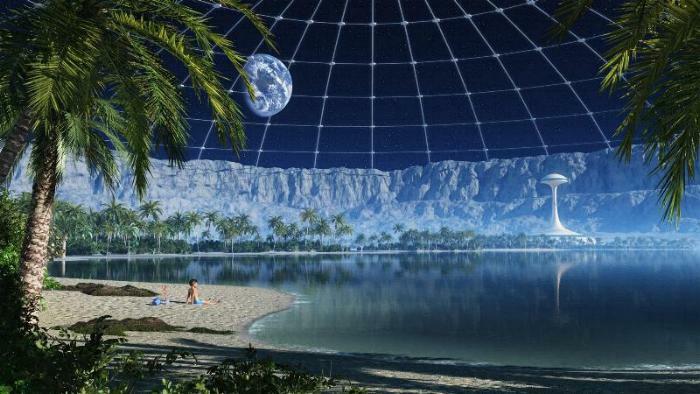 Thats my vision of terraformed craters. In my view, deimos and phobos would be parraterraformed since they are very small, mercury is way to hot, Venus would support atmosphere colonies, mars would totally terraformed, ceres would be colonized aswell as large asteroids, Jupiter's moons left alone for surface colonies, Europa's ocean would be explored, Saturn's moons colonized and titan for habitation purposes and not terraforming, I like planets to be preserved. Uranus and Neptune's moons would be colonized, Pluto and it's like would be planets by my rules as I am the supreme dictator in this case. Pluto would have some colonies, might be terraformed. Earth would go largely solar,wind and nuclear for power, NO FOSSIL FUELS ALLOWED only "alternative" and the killing of animals for fast food and whatnot will be prohibited and anyone caught doing so would be in harsh labor. Anyone who commits crimes is submitted to labor and will build monuments and such and then be put into regular jail. There would be a law stating everything that is recycled needs to be recycled or will face jail time. Landfills would shrink as trash would be sent to the sun or Jupiter for burning up. Venus atmosphere would be stripped to make way for terraforming and habitation. 10. Abolish the 8 planet model and have Dwarf planets be full planets, so there is 13. My Very Educated Mother Cannot Just Serve Us Nine Pizzas—Hundreds May Eat! 12. Alcohol and tobacco would be done away with.Drug users would learn skills to give themselves self worth the first time by being sent away to camps for a year. 15. Schools would teach self defense, how to swim, how to live off the land, how to drive, and first aid as part of the curriculum. 18. Change Australia's and New Zealand's flag to something without the union jack on it, and have a flag referendum held for the choices of flag. 20. Students have a class called "Economics" in which they learn about how to handle bills, money, taxes, etc. 39. Satanism, Illuminati, secret societies, black cubes, and satanic symbols removed from view. 42. Prisoners have the choice of punishment. Death,Jail,Labor, Community service while being monitored, are the choices. 43. Have a palace built for me, I choose what rooms and stuff I want in it, Private jet and train, every window bulletproof and everything made fireproof. I basically do as I want. 44. The UN is renamed to "United Imperial Earth" and established as a super nation with countries as subdivisions. 47. Everything is spelled the way it sounds to me. 48. Saturn's rings be melted and removed, then Nuke Saturn and turn it into a dim mini sun. There would be bases before the destruction, moon would be mined of everything useful.